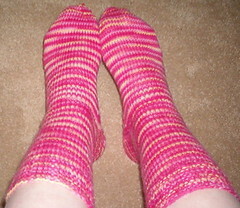 Nicole's Needlework: Spring Socks Finished! I woke and started working on Gloria's back some, just a few more inches and I'll be done with it. Then I'll probably start the other front. In other personal news... my dh got his award the other day for being shot. He would never complain to his co-workers, but he told me that it's not the award the officers normally get if they've been shot. They usually get the Medal of Valor and he got the next one down, a new medal call the Blue Star. It's a very nice award and I'm just grateful he's alive to receive an award, but once a I was at the ceremony I knew what he meant. It was all politics. There were three people who got the top award (none were shot or hurt in any way). Two did deserve the award, as they were in a dangerous shoot out. The third (in my opinion) did not. One of the wives on stage was almost crying and I was thinking... what is she crying about?? Did she have to stay for 3 days in Grady hospital? Did she have to give her husband 16 (yes 16) shots of Lovinox to her husband in the stomach because he developed a blood clot? I didn't cry, or get teary-eyed, I have been through a lot and had to stay strong and hold it all together for everyone, and I guess I still feel that way. Now if they would've had me talk that might have been another thing. Anyway, it definitely helps writing about it. I'm glad the ceremony is over and hopefully I won't have to go to another one unless dh gets promoted or wins a fitness award or something! :) That's all for now... write more later! THAT ROCKS!! YOU DID AN AWESOME JOB. YOU SHOULD SELL SOME STUFF. 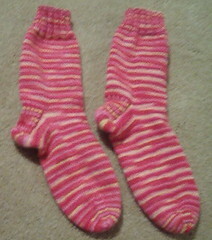 Love your socks! Sometimes all we can do is grin and bear getting through these ceremonial things we have to do in life.